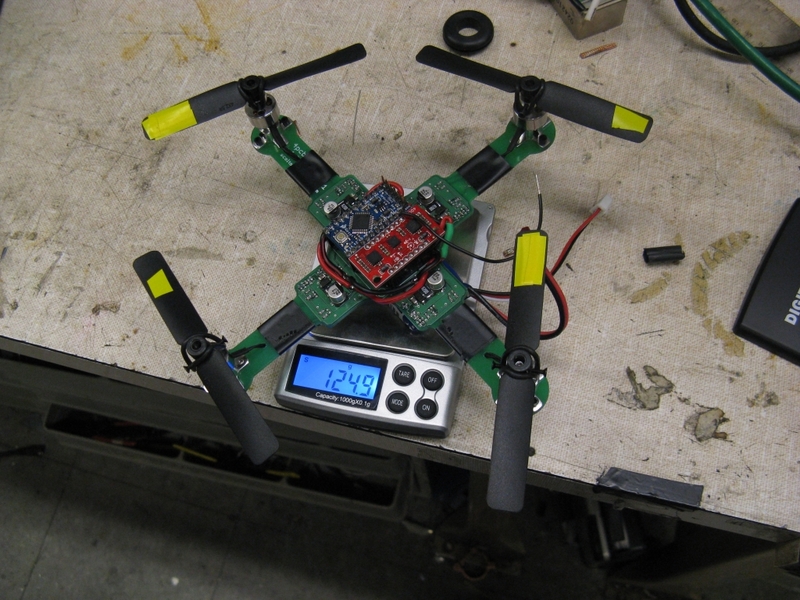 4pcb is a micro-size quadrotor (4" props). It's named 4pcb because the entire structure is a single printed circuit board (printed by Advanced Circuits, http://www.4pcb.com). Fiberglass is pretty strong, right? After helping out with a previous quadrotor build, I wanted to make a smaller one and combine the electronics and structure into a single board. 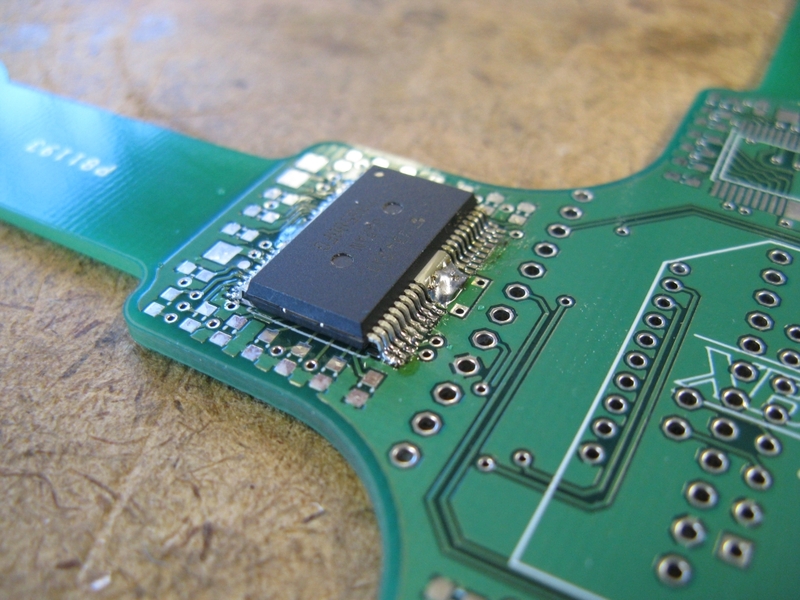 The most important part to find was a surface-mountable brushless motor control IC. 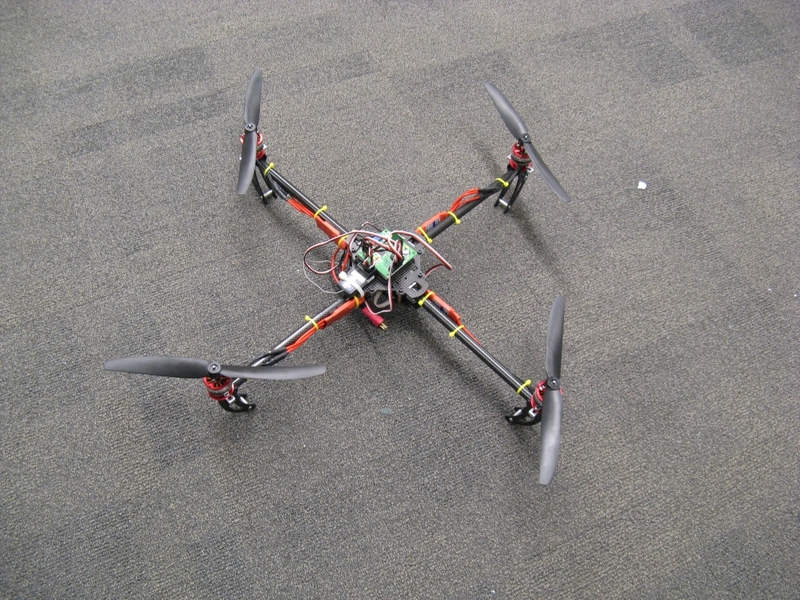 Luckily, the TB6588FG does the job nicely, taking the place of hobby ESCs and the associated wiring. It also has better dynamic performance than hobby ESCs, since it uses an analog speed command instead of RC-style 20ms PWM. 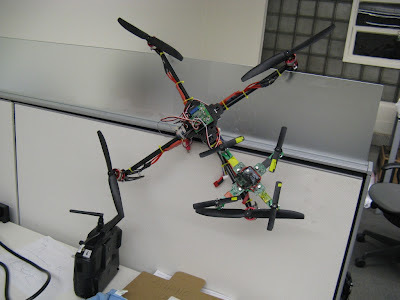 Kramnikopter is a completely off-the-shelf quadrotor build based on the Turnigy Talon frame kit. It's named after an identical build by Daniel Kramnik, of Tesla Coil fame. After flying his Talon, I decided that I liked the frame enough to build my own. It's the perfect size: large enough to be controllable, even in wind, but small enough to fly indoors. The build quality is excellent and I would definitely recommend this frame to anyone who wants an inexpensive quadrotor to play with. The entire kit, including radio, can be purchased for about $150. Pictured with 4pcb, for size reference. Good for spying except it's noisy! I say it's good for flying and a great example of combining the functions of several components in to one piece, like a motorcycle that uses the engine as part of the frame. Well done! I'm doing a quadrotor completely from myself.....the foundamental problem of complementary filter is the noise off Accelerometer...in my case often the noise take +/- 500mG.....is normal...i try all think...rubber balanced motor and propeller. My coeff filter are. Gyro = 0.99 e Acc = 0.1 in addition i did a Low Pass filter at 5Hz from the raw data of accelerometer. 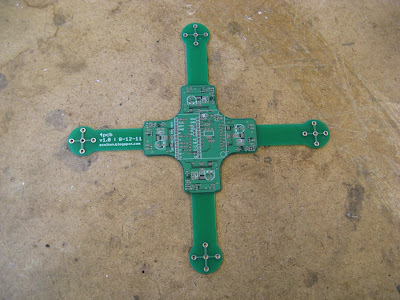 Updated the link for the PCB quad source files above. Wonderful. I wonder whether those super-duper hall-effect current sensors could be replaced with .. just PCB traces (shunt), designed for say 5..200 mV drop, detectable with the ADC for cost reduction. I would test whether it works, but your FF v1.2s & other ESC design files are unavailable (google drive links're dead). I don't have enough strength to make FOC, so I'll try simple BEMF-based switching. 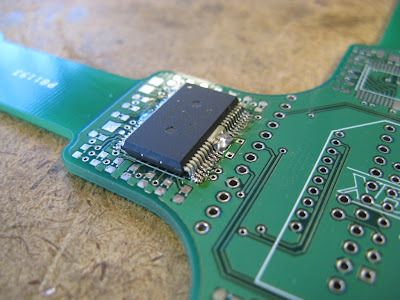 Low-side shunt resistors are very common, so I suspect just a trace would work too. Might not be as consistent as a 1% resistor but with calibration it would probably work just fine. 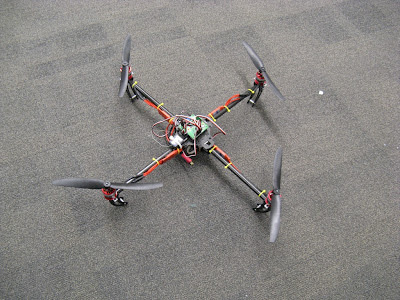 I would like to suggest the best book on Drone or Quadcopter making. 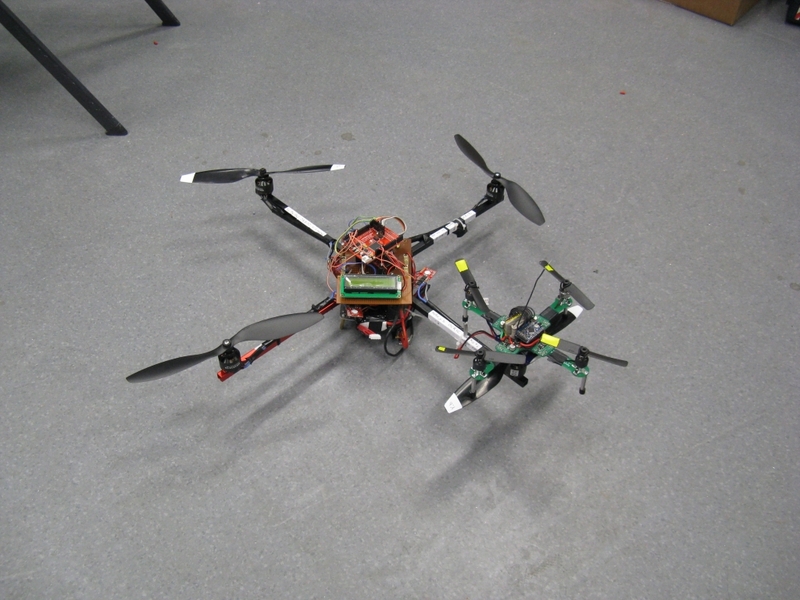 "The DIY Drones for the Evil Genius" book https://www.onlinebooksreview.com/articles/build-drone-book#1259861465 shows you how to construct the most powerful drone from very inexpensive parts. All the guideline are given very specifically and with step by step explanations. It offers you how to add personalized features and make yourself a full-fledged pilot. It covers not only the safety and mechanics but also shows you a perfect drone design and complete assembly. It will make yourself more efficient for implementation of your idea. I normally remove comments with links but this one made me nostalgic for the days when drones were called quadrotors and building your own was actually the only way to get one.